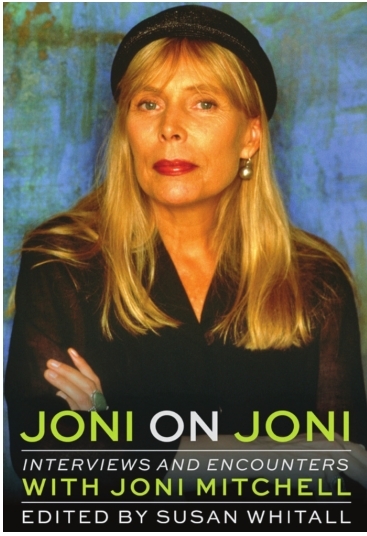 Reading "Joni on Joni," a compilation of interviews with music diva Joni Mitchell, elicits intense memories of good times and bad times and of breakups and makeups. Mitchell's music is an important soundtrack for baby boomers and the new book, which consolidates 27 integral interviews Mitchell had with writers from 1966-2014, provides insight - in Mitchell's own words - into the meaning of both her heart wrenching and ebullient work. Readers will likely learn some personal items about the quirky Mitchell they might not have known, like her penchant for smoking cigarettes (she started smoking at age 9) and her bout with childhood polio. The compilation is aptly edited by Detroit music journalist Susan Whitall, who brings nearly 50 years of experience in writing about music to the book project. Whitall began her career in 1971 as an editor for the iconic Creem magazine, and in 1983 she moved to the Detroit News as a feature-music writer. She has written two other books: "Fever: Little Willie John's Fast Life: Mysterious Death and the Birth of Soul" and "Women of Motown." Although Whitall never interviewed Mitchell, she remembers how in her dorm days at Michigan State Univeristy you knew when someone had a breakup. "They would play Joni Mitchell's 'Blue' all day," Whitall said. Readers also learn about Mitchell's relationships with her multiple husbands and many famous boyfriends - including one of her first loves, Graham Nash, along with musicians James Taylor, David Crosby and Leonard Cohen. In the interviews, we learn that Mitchell holds no ill will against her many lovers and that she is still close with Nash and Taylor. Nash, at Mitchell's request, picked up her award for being inducted to the Rock 'n' Roll Hall of Fame in 1997. Mitchell tells one interviewer about her bitterness in being passed over before getting admittance into the Hall. Through her interviews, readers also learn that Mitchell was initially cool to the talents of Bob Dylan and still holds a grudge against Judy Collins, despite Collins' putting her on the way to stardom with the recording of Mitchell's song "Both Sides Now." In an interview with the L.A. Times, Mitchell tells the interviewer that Dylan was a "fake." Most recently she said that Taylor Swift isn't talented enough to play her in a movie about her life. She acknowledged Swift may look like her, and told her "good luck" if she gets the role. Readers also will be impressed with Mitchell's depth of intellect. Mitchell tells how she weaves Shakespeare into her interviews and deftly drops Greek literature into her music and interviews. We find that Mitchell's candidness is both one of her strong points and weaknesses. She is forthright in describing her relationship with her first husband. She gives him kudos for helping her on the way to stardom when the couple lived in Detroit in the midto-late '60s, before Mitchell split to Laurel Canyon and a relationship with Nash. This collection of interviews is a great stand-in for an autobiography without hitting the reader over the head with a recitation of facts. Readers learn she comes from the plains of Canada, a place she returned to often during her career, and that she gave up a daughter for adoption. She would later reunite with the daughter and wrote at least two songs that reflect on the abandonment. In the interviews, Mitchell tells how her mother, whom she calls a "real hillbilly," would not let her have a guitar when she was growing up. "Mitchell was a solitary child and only child growing up and her mother, a teacher, would drill her," Whitall said. In her interview with Mary Atkins for the Canadian Reader's Digest, Mitchell went on in detail about her roots and, surprisingly, her attraction to both the domestic arts and feminism. She also admits enhancing her vocabulary by studying the magazine's "Word Power" feature. Although her song "Woodstock" became an anthem for the counterculture, we learn in the interviews not only did Mitchell not attend Woodstock, but she had disdain for the hippie lifestyle. It becomes clear from the interviews that Mitchell was often torn between her two loves: music and art. She describes herself as "an artist who writes music." Her artistic creations were to be seen on many of her album covers. One cover will have you shaking your head. On the record album "Don Juan's Reckless Daughter" Mitchell dresses with black face. When asked in an interview about the portrayal she defended it. Also revealed through the interviews is Mitchell's love of rhythm and blues and jazz, which is most notably heard on her collaboration with the great Charles Mingus on "Goodbye Pork Pie Hat." Whitall said initially she wanted to only use interviews which hadn't previously been anthologized, but her editor convinced her to include interviews she read, but the general public hadn't seen. The editor was able to locate interviews from TV and radio which had not appeared in print before. This article has been viewed 979 times since being added on November 29, 2018.